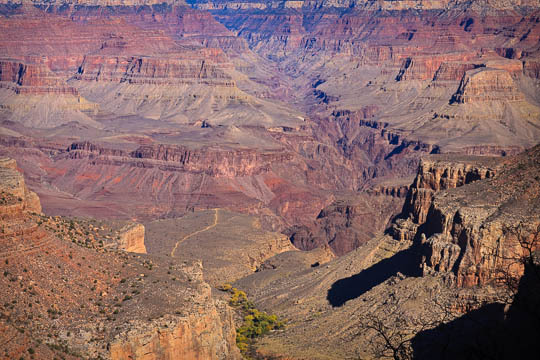 It’s tough to do in a blog size photo but that line running across the plateau is a trail. It seems to drop into the river…but it doesn’t. 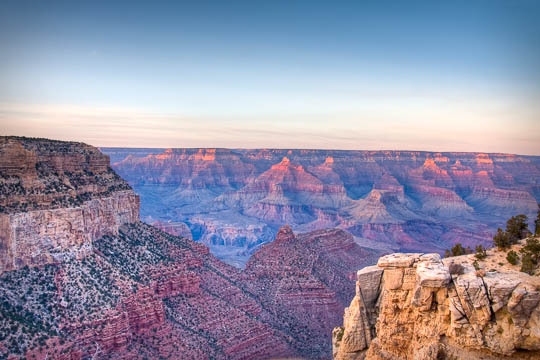 It does give you a sense of how big the Canyon is and how small we are. If you look closely you can see the ear to ear grin on the Grunge’s face. 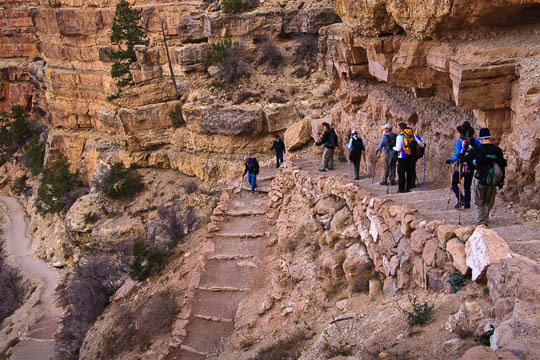 Today, the Burgess team of 2012 – different than Team Burgess 2009 – heads into the Canyon. Dudley will have Judy along for part of the way and sons Andy, Matt, and Mark for the duration. There are friends of the family going as well. 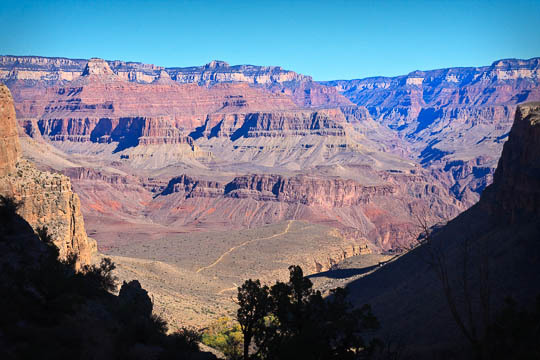 The Grunge has sons Chris and Jeremy along – I can’t wait for Jer to experience it all. Chris and the Grunge are no longer “rookies”…WooHoo! Grunge Is Out Of Town! Grunge…son Chris ’94…son Jeremy…Dudley Burgess ’64…son Andy ’90…son Matt ’92…son Mark…and other instant friends are in there somewhere. See the big smiles? That’s us. WomenCertified.com recently placed a full page ad in USA Today (October 15, 2012) to name it’s best hospitals for patient experience. Lafayette General Medical Center in Lafayette, Louisiana was one of the three noted in Louisiana. CEO Is A Wabash Alumnus! That’s Dave Callecod, Class of 1989 and President and CEO of Lafayette General. 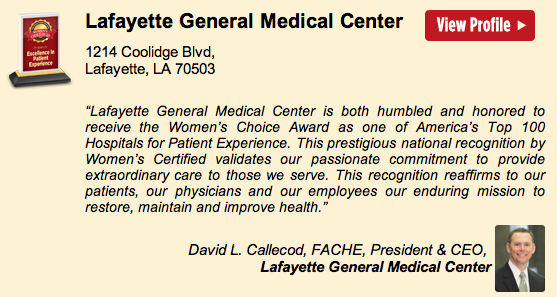 Congratulations to Dave and the Lafayette General team – well done! The Washington University tailgate was great fun. Carol and the Grunge caught up with Kyle and Carol Finley (parents of Chad ’08). Carol and Kyle have the perfect tailgating RV and since we saw them last, they’ve added matching Segways. 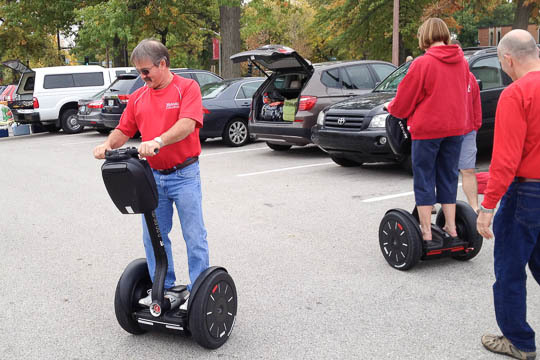 Here are some other great friends and Wabash Superfans, Gary and Sherry Ross, checking out the Segways under the watchful eye of Kyle. The Grunge rode as well but he’s a little embarrassed to point out that Kyle had Grunge’s speed set to “Turtle”! 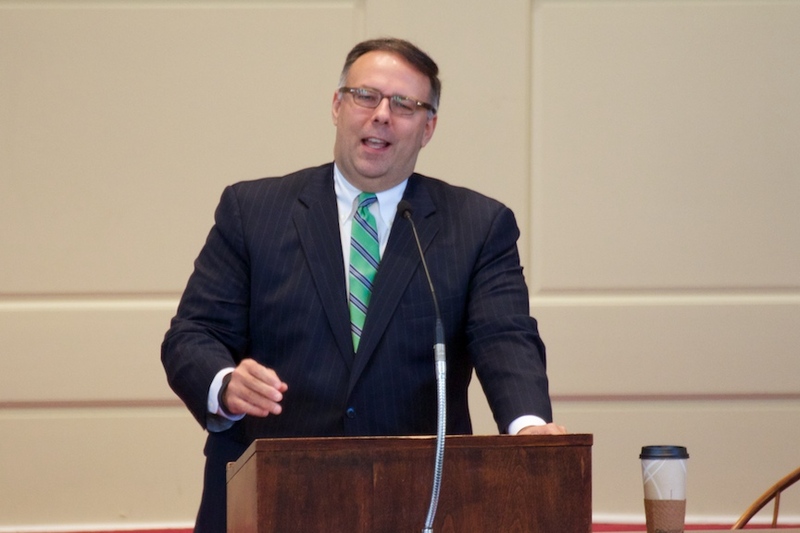 Greg Castanias ’87, Wabash’s alumni board president, gave a Chapel talk yesterday entitled “Free”. It will be on the College’s You Tube feed soon, if not already. Greg’s talk was on Tuition Free Day. This day occurs about 1/3 of the way through the college’s year. Symbolically, it recognizes that funding the college’s operation to this point has been the monies provided by Wabash students and their families. Past this point the college relies on the generosity of the college’s alumni and friends to keep going. 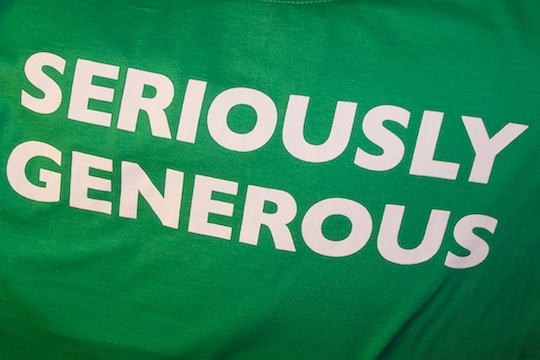 In other words, we count on our alumni and friends for 2/3s of our funding. Greg told the story of his own college search and how critical his Honor Scholarship was. Without it, he was headed elsewhere. With it, Wabash was possible. A familiar story. Grunge has been there. He then challenged the students to pick up the mantel and carry it forward. Keep Wabash strong. Keep Wabash providing a high quality education for young men. Keep Wabash free from outside influence. Freedom isn’t free – no matter how you slice it. For a few other Tuition Free Day photos, click here. 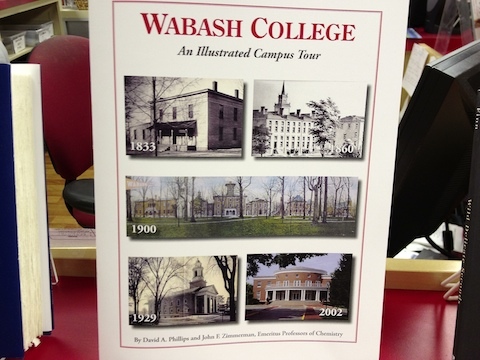 Emeritus Professors David Phillips H’83 and John Zimmerman H’67 have authored an illustrated campus tour booklet. You can get this document – complete with up to date and historic photos- at our Bookstore. It’s a collector’s item in my book. So, when you’re in the Bookstore picking up your Monon Bell tickets, better also grab a copy of the tour book. Just remember, you saw it first here. But don’t tell anyone. Waive the App Fee? How? More and more young men are applying to Wabash on-line. 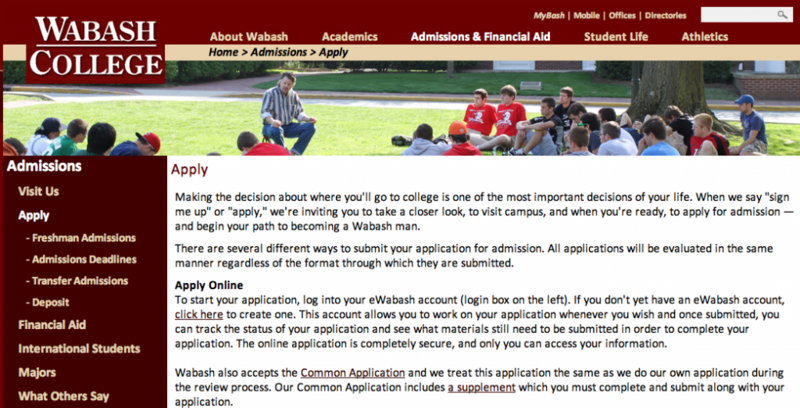 They may be using the Wabash application (see the link via the picture above) or the Common Application. The question we get asked is how does an alumnus waive the application fee like the good, old days? Simple. All the applicant has to do is enter your name and class year as the referring alumnus. Da Grunge and 1971. That will take care of the fee. Easy. Straightforward. OK…I couldn’t let the view out our front door go by without a shot. 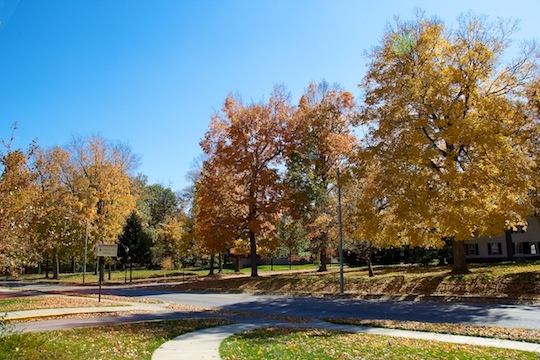 After the rains this past weekend, those remaining leaves are hanging on for dear life. They’ll lose…we all know that. But that’s OK. We all go at some point anyway, right? Great turnout at Washington University last Saturday. At kickoff we had more fans than they did. A shame, really. Happy fall. Hope to see several of you at the Wooster game Saturday.